Do you battle with the removal of stubborn smears, water streaks and dirt build-ups from your windows? Do they cost you too much elbow grease and you have no will to be involved in this chore? This activity will no longer consume a lot of your time and energy! The specialists of window cleaning in Heron Quays are going to help you out! You will be able to use your free time as you like – the trained and dependable team members will manage the sweeping and scrubbing. We offer impeccable cleaning services for all types of windows. Read further and find out more about the different advantages you can have. We also provide our professional services in nearby areas: Westferry, East India, Mudchute, London Arena, West India Quay. You can enjoy perfectly looking office with the help of the specialists of commercial window cleaning. You can count on our first-rate services for all types of business premises. For instance, if you own a small shop, we can completely clean its windows by using our water fed extension pole tools – it gives us the chance to reach up to the fourth floor. If you seek spotless look for the glass panes of a tall business property in London and the neighbouring areas, we will put in use our rope access gear. In both cases, you will appreciate perfect results right away. We provide top-notch window cleaning by using advanced equipment. We provide impeccable and absolutely clean look for your glass surfaces, roof windows and conservatories with water-fed cleaning system and jet washing. The poles we use are connected to water reservoirs in our vans, thus eliminating the risk of damage to the exterior of your home or workplace. In addition, we use completely safe rope access equipment to clean glasses on tall buildings. You can benefit from these methods today – call us on 020 3746 3113! The employees have the skills and the needed equipment to provide you with both private and business window cleaning. You can count on us for every kind of glass surface cleaning. For example, we can polish small or double windows, sash ones, French doors, bay windows and patio doors. In addition, if you have garden glass surfaces, conservatory or roof windows, we can clean them as well. We use the most progressive ways and the next-generation equipment for all the aforementioned window types. The experts of window cleaning in Heron Quays will revive your house. 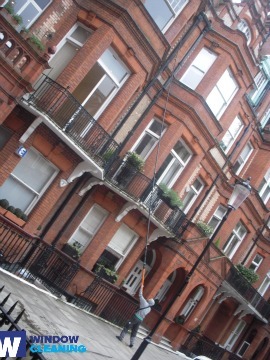 We offer the best window cleaning services in Heron Quays. Our practice includes water fed extension pole system and also jet washing. We keep your health and safety with ecologically-friendly solvents and purified water. Be one of our satisfied clients – dial 020 3746 3113 and contact our customer care. You can also order our services online – just fill in our short request-a-quote form or use our chat facility.